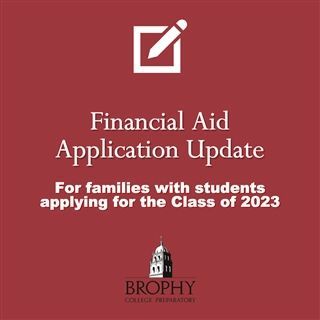 Families with sons applying for Brophy's Class of 2023 can begin the financial aid application process as early as Dec. 15. The Business Office moved up the date this year to be able to provide preliminary award amounts shortly after admissions decisions are made in early March. Families are encouraged to apply as early as possible. The application fee is $35. Contact the Admissions Office if a fee waiver is needed. For detailed information visit the Tuition and Financial Aid page on the website. Please note that the Admissions Office will host a Financial Aid Seminar at 8:30 a.m. on both of January's HSPT testing dates - Jan. 12 and Jan. 26. For more information, contact the Admissions Office, or read more about it here.